Home may be where the heart is, but it is also where germs, dust, mold and mildew, and other allergens set up shop. 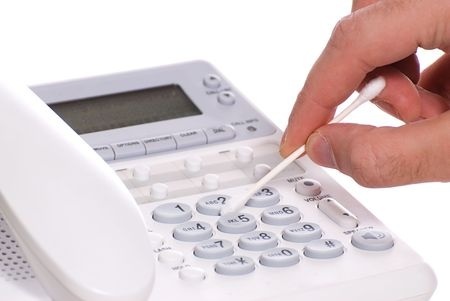 Arm yourself with disinfectant, and then shoot (or swab) to kill germs and bacteria from common home surfaces, like the telephone. These nasty, invisible interlopers thrive even in households that look clean. They ride home from school on your child's hands, hitch rides on your handbag or briefcase, enter with foods that you bring home, and grow and multiply beneath the sink. 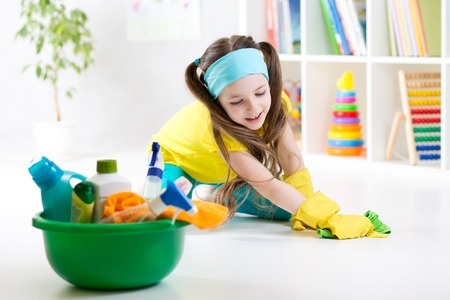 Although you really can't hope to eliminate such irritants entirely, there are some ways of cleaning the house that will help you to keep these menacing germs and allergens at bay. 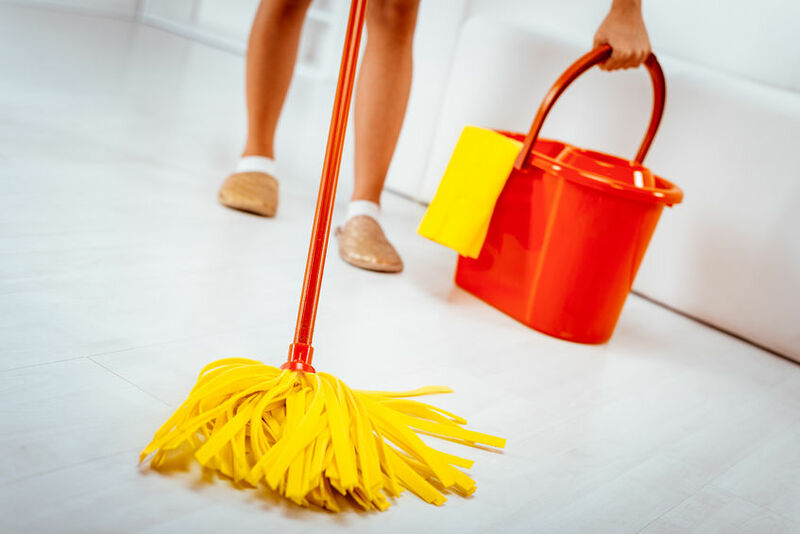 By focusing your cleaning efforts on the major germ and allergy hot spots, you'll be able to keep things well under control simply by cleaning the house. Light switches, telephones, computer keyboards, remote controls for gaming systems, and doorknobs, are favorite spots for any of the 150 sneeze- and cough-creating common cold viruses today. Such places are also favored by the lesser-known but equally unpleasant rotavirus, which causes diarrhea, especially in infants. These bugs can survive for hours on hard surfaces in the home, especially plastics and metals, as well as on children's toys. If someone in your family has the telltale signs of a cold virus or complains of intestinal upset, clean and disinfect the common surfaces and toys in your home daily until symptoms disappear. A cleaner labeled "disinfectant" will kill most tough germs on hard surfaces. Spray directly on an area, and let the solution do its work for 10 minutes. Wipe dry with a paper towel or lint-free cloth. As a preventive measure, disinfect these surfaces weekly. Areas prone to dampness - such as bathroom surfaces; the washing machine, humidifier, and air conditioner; and the area under kitchen, bathroom, and laundry sinks - provide perfect breeding grounds for mold and mildew. Mop up any water in these spots and clean away surface mold with a fungicide or a bleach-and-water solution. Your cozy bed is a snug spot for dust and dust mites to settle in. These allergy triggers thrive in sheets, blankets, pillows, carpets and rugs, and on drapes and blinds. You'll rest more comfortably if you take a few steps to keep these microscopic culprits in check with housecleaning. Wash your bed linens once a week in the hottest water safe for your sheets. Your comforter, blanket, and pillows should be washed at least monthly. Damp-wipe or vacuum your blinds regularly - they're a virtual magnet for dust. If you have feather pillows or a goose-down comforter and you often sneeze all through the night, try changing to polyester bedding (it doesn't attract dust mites as much as cotton and feathers do) or consider encasing all of your bedding - both mattress and box springs - in a nonallergenic plastic cover. Regular vacuuming - at least weekly - can help keep your home's allergens count down to livable levels. Use dust-filtering vacuum bags, an inexpensive way to keep most of the sucked-up dust from escaping through the exhaust. Microscopic life thrives in all bathrooms. Without the proper strategies in place, even your toothbrush isn't safe from cold viruses, rotavirus, salmonella, Escherichia coli bacteria, and mold and mildew. Microscopic life thrives in bathrooms, so focus your disinfecting efforts here. These pathogens and allergens flourish in and on toilets, on faucets, on the floor and walls, and in damp towels and washcloths. Make it a weekly priority to disinfect the toilet, sink, and faucet handles, using a disinfectant cleaner or diluted bleach and water. Apply the cleaner, let it stand on the surface for 10 minutes, and wipe clean with a paper towel or lint-free cloth. Regularly clean the base of your soap dish in the shower and on the sink. Every three days or so, replace used bath towels and washcloths with clean ones. Always close the lid of the toilet before you flush to prevent stirred-up germs from escaping into the air and settling on bathroom surfaces. After using towels, fold or hang them loosely to dry; this helps prevent germs and mold from getting a toehold. Use a toothbrush cover to prevent airborne germs, yeast, and molds from colonizing on the bristles and getting into your mouth; or consider a toothbrush sanitizer. In the kitchen, proper handling of raw meat, fish, and poultry can stop most germs associated with them from multiplying to levels that can make you and your family ill. While most pathogens that occur naturally in uncooked foods are killed by proper cooking - many germs can spread long before you pop the entree into the oven. E. coli, hepatitis A, and salmonella - the most common contaminants - can find their way onto a sponge or dishcloth; you, in turn, can then spread the bacteria all over your kitchen unless you make an effort to stop them. The single most important thing you can do to ensure your family's health and safety is to wash your hands with warm, soapy water for at least 20 seconds before and after preparing food. This will prevent you from spreading meat-, poultry-, or fish-borne bacteria onto refrigerator doors, cabinet handles, and countertops, where they'll be lying in wait next time you reach for a leftover slice of pizza. In addition to washing your hands, you can help prevent cross-contamination by washing in hot, soapy water the utensils used to prepare your raw food. That includes all knives, cutting boards, and serving platters that have held raw meat, fish, or poultry. When grilling, don't serve meat on the same platter that you used to carry it outside before cooking. If your kitchen counter comes in contact with even a drop of juice from uncooked meat, poultry, or fish, clean up the area with hot, soapy water and paper towels - not the sponge you use daily. To kill all the germs, however, you'll need to clean the surface with a mild bleach solution (one part bleach to nine parts water) or use a commercial disinfectant. Keep all kitchen surfaces dry; bacteria survive no more than a few hours when moisture is eliminated. 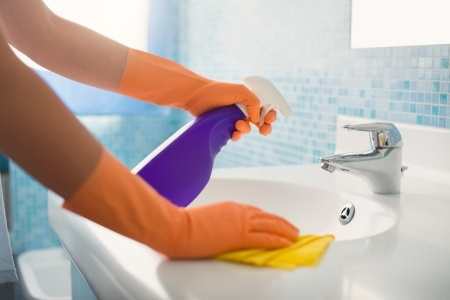 Even your kitchen sponges and dishcloths - the very items that are supposed to help you get rid of lurking germs - can be part of the problem unless you wash them regularly. You should replace sponges every two weeks. Regularly throw dishcloths in the washing machine - and always use hot water and bleach. Finally, use a plastic cutting board (not wood) for raw meats - it is less likely to harbor bacteria. Wash it in hot, soapy water after each use.